Ah the heat, how I loathe you so and just in time for the first day of summer tomorrow. We have slowly been taking out the last of the spring crops, mowing the remains and getting ready for seeding summer cover crops or replanting those beds to summer flowers. At least there is time hiding in the AC to do some long range planning, warning– farmer geek talk coming! 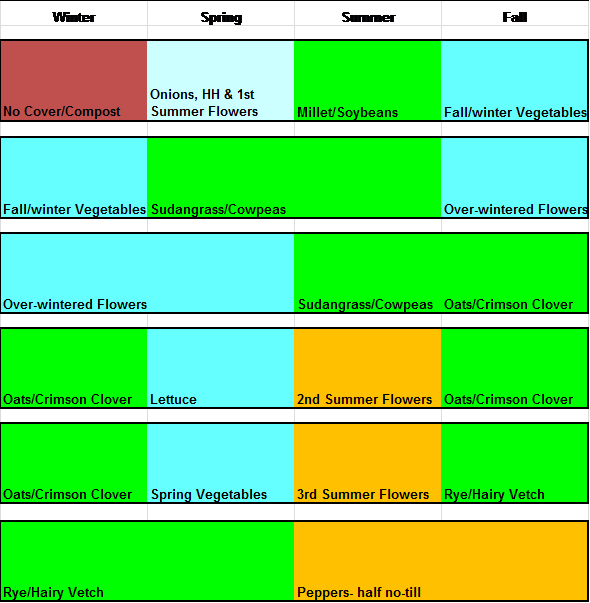 Over the years our crop mix and intensity has become more complex, especially now with year round production it makes the crop rotation planning more difficult. Heading into our third winter with Jennie and all winter growing it has become time to make some major changes in where we plant crops and in what order, a.k.a. the rotation. In theory we have only added slightly more than one quarter of an acre of new crops but trying to pack that into an already full program has thrown off our carefully choreographed system. Cover crops are the foundation of our soil management and it was already difficult to find adequate space and time to fit them into every field each year. The addition of the new fall/winter crops has been made temporarily possible by knocking out a set of winter cover crops on one field and foregoing the fall bed preparation for spring vegetables that is critical to getting those crops properly planted on time. The easy answer would be to expand and add more fields but we are already using all the best soil we have up on the hill. We currently have 5 quarter acre blocks that we are now trying to fit nearly 9 quarter acres worth of crops into and another 4 of cover crops, not easily done. There becomes two schools of practice in sustainable agriculture when it comes to annual crop production, extensive and intensive. The “extensive” farmers we know basically have two farms, one in cover crops and one in cash crops flipping them each year or so. This allows them to rest the soil and build organic matter but also means they have to have twice as much land, a luxury most farmers don’t have, like us. The other end of the spectrum is no cover crops and to just rely on organic matter sources imported onto the farm- manure, leaves, hay, compost, etc.. Not only more expensive and labor intensive but in many ways not as biologically diverse which can lead to a less stable/sustainable system. So I have spent a lot of time over the last months trying to rethink our rotation and this week put some hours into staring at the design on paper. The result is we need more room. We need to go from a 5 year rotation to 6 years but there is not enough field up on the hill to accommodate that. The best soil on the farm is down in our bottom field but we stopped using that field in the regular rotation back around 2000 after too many floods back in the 90’s. With climate change and the prospect of more intense storms that could bring more flooding we are not excited about using the bottom field but that is where we are heading. It hasn’t flooded since 1996 and hurricane Fran so let’s cross our fingers and hope for the best. 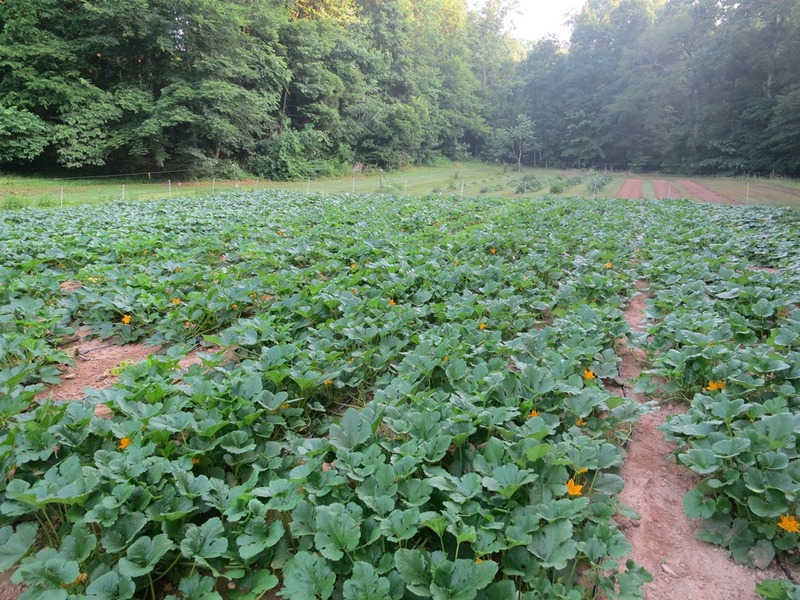 This is the field we are going to put back into the regular rotation, it grows great winter squash! More volume of tomatoes this week but still mostly Cherokee Purples, Orange Blossoms and red Ultrasweets and Big Beefs. A few pints of Sungolds and some other cherries. A smaller amount of lettuce with dark red and lighter green and red tinged Summer Crisp, that cross between Romaine and Leaf lettuces that can take the warm weather. A few very tender Green Oakleafs. We will probably have a lettuce gap for a week or so. Lacinato Kale. The last of the Sugarloaf, the white and less bitter radicchio and Red Radicchio until fall. The first of the cured sweet Red Onions and Long Red of Tropea fresh onions, great for grilling and other uses. Beautiful Leeks. Basil along with Chives and Italian Parsley. Fennel and Cucumbers! Beets in all three colors; Red, striped Chioggia and Golden. Lots of Carrots. Fragrant Oriental lilies and non-fragrant but deeply colored Asiatic Lilies. Tall graceful blue Delphiniums. Delicate Campanula (Canterbury Bells). Brilliant Zinnias. Annabelle Hydrangeas and Dianthus. Of course beautiful Bouquets. Would it pay to put in some drainage in the bottom field; catch basins whereever the water comes down and into detour pipes? The problem is not from water coming down the hill or the creek, we have drainage ditches and other diversions for that and the soil is actually really well drained internally. It is when the Haw River floods and backs up on the field, sometimes up to 5 feet deep (or deeper), that we can do nothing about. There are few crops that can survive under that much water. rice, water cress and water buffalo? I enjoy reading your blog, particularly this one with your new and improved rotation schedule. Thanks for sharing. I wonder if your intensive rotation would be suitable for our sandier soils. Do you think we could accumulate enough plant nutrition from cover cropping to work 9 quarter-acres into 5 quarter-acre plots, as you put it? In other words, soil type could dictate intensive vs. extensive approach, yes? Sandy soils are definitely the hardest to keep OM levels up in, especially in hot humid climates. You will need to monitor your OM levels either through soil testing labs that do that or by watching your CEC numbers. We try to have our ground in a cover crop half the year if possible and that has kept our sandy loam top soils with very slowing improving CEC numbers.